Department of Accounting and Corporate Governance, Faculty of Business and Economics, Macquarie University, NSW 2109, Australia. 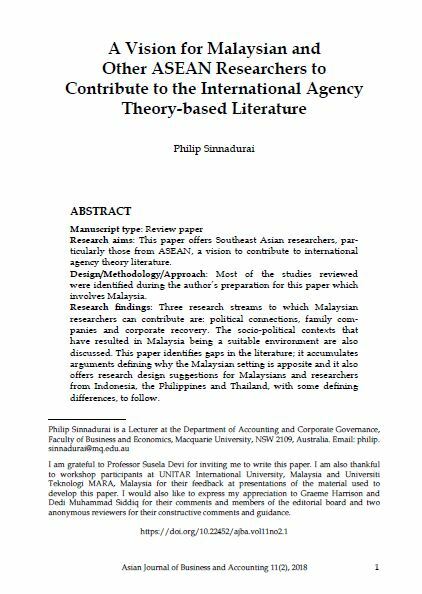 Research aims: This paper offers Southeast Asian researchers, particularly those from ASEAN, a vision to contribute to international agency theory literature. Design/Methodology/Approach: Most of the studies reviewed were identified during the author’s preparation for this paper which involves Malaysia. have resulted in Malaysia being a suitable environment are also discussed. This paper identifies gaps in the literature; it accumulates arguments defining why the Malaysian setting is apposite and it also offers research design suggestions for Malaysians and researchers from Indonesia, the Philippines and Thailand, with some defining differences, to follow. Theoretical contributions/Originality: The outcome drawn from this paper assists Malaysian researchers in utilising the agency based theory to approach various topic selections and executions. The comparisons and contrasts made between Malaysia and the other three ASEAN countries may further motivate researchers of the ASEAN region to engage agency theory as a base for their research. SINNADURAI, Philip. A Vision for Malaysian and Other ASEAN Researchers to Contribute to the International Agency Theory-based Literature. AJBA, [S.l. ], v. 11, n. 2, p. 1-54, dec. 2018. ISSN 2180-3137. Available at: <https://ajba.um.edu.my/article/view/15268>. Date accessed: 25 apr. 2019. doi: https://doi.org/10.22452/ajba.vol11no2.1.